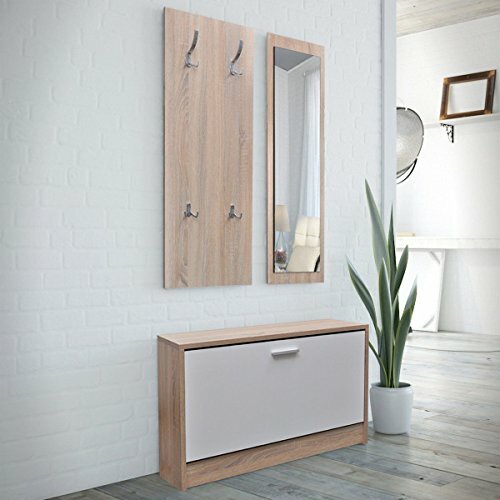 This 3-in-1 wooden shoe cabinet set includes a shoe cabinet, a wood-framed mirror and a wooden coat rack. This set offers a myriad of storage solutions. The shoe cabinet features a large compartment with a middle partition to keep things organized, and a simple but stylish design. You will no longer be annoyed by shoes cluttering your floor. The coat rack is equipped with 4 sturdy metal coat hooks. The mirror is big enough to keep you well preened. Made of high quality wood, our shoe cabinet set is easy to assemble.